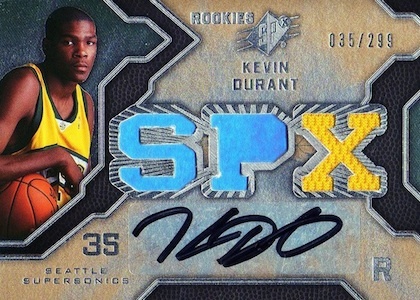 Kevin Durant is one of the hobby's most popular players and a favorite for many collectors. A superstar with the Golden State Warriors, Durant is poised to take his rookie values to new heights thanks to his championship success. Firmly establishing himself among the hobby elite, Kevin Durant rookie cards will move even higher if he can string together a few more titles. 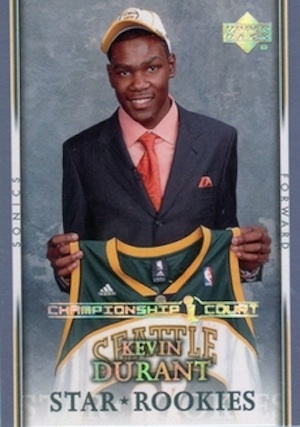 Starting with his early days in Seattle for the SuperSonics, Kevin Durant rookie cards (and later his sneakers) have been heavily collected. The face of the Oklahoma City Thunder for quite some time, Durant saw several losing seasons as he gained experience and a viable team was built around him. Although he was surrounded by talent in OKC, including Russell Westbrook, Kevin Durant elected to team up with the Warriors, and Steph Curry, for a better shot at a title. Shop for Kevin Durant rookie cards on eBay. 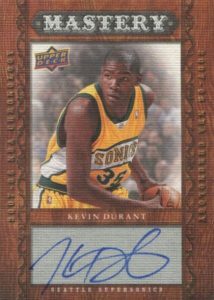 Now one of several notable NBA players that are exclusive to Panini products, this was not the case during Durant's rookie season in 2007-08. 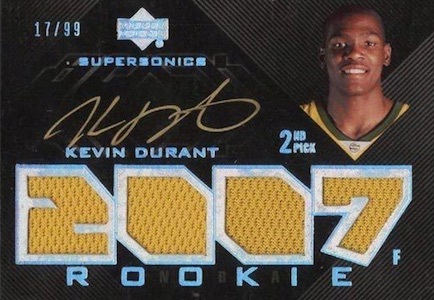 Therefore, there are over 30 Kevin Durant rookie cards across several brands and price ranges for collectors to pursue, with the very top selections documented below. The following Kevin Durant rookie cards include some of the best options available and all the main signed rookies. Regardless of design preference, collectors should be able to find several that would fit nicely in their collections. However, these cards stand above the rest and a few can get very, very pricey. 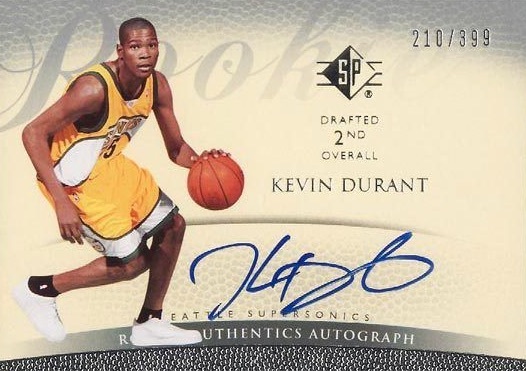 For a larger group of choices, see our complete Kevin Durant rookie card checklist. You can also track the most-watched Kevin Durant cards on eBay with a real-time KD hot list. Click the listings or images to shop for singles on eBay. 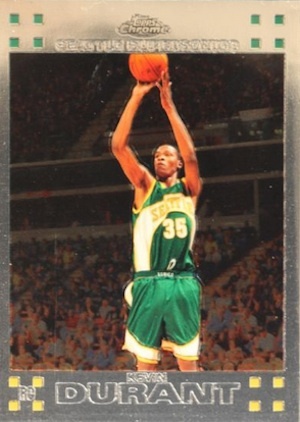 This flagship UD Kevin Durant rookie card is a key choice for collectors on a budget. 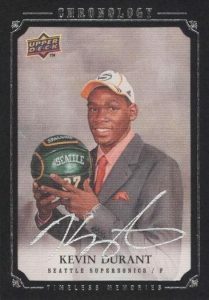 Featuring a draft day image of Durant, the solid layout is hurt slightly by the cluttered text at the bottom of the card. Because several of the high-profile rookie players were included as short prints, Durant among them, this relative rarity helps keep the values a shade higher. When it comes to Finest basketball, there is rarely anything subtle about design. This tradition continues with 2007-08 Finest Basketball. If the bright red prominently featured in the base card does not suit your tastes, several Refractor parallels are available that swap the colors. These include base Refractors, along with the Silver (#/319) Blue (#/199), Green (#/149), Black (#/75), Gold (#/25) and X-Fractor (#/15) editions. 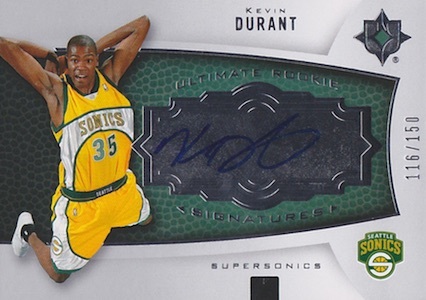 Despite a higher print run, Kevin Durant's Bowman Chrome rookie remains a solid option. The Chrome name always carries credibility in the hobby and collectors seem to gravitate to shiny items. I could personally do without the draft board image that is used as the background for the card. Bowman Chrome also features several parallels that remain popular: base Refractor (#/299), Black Refractor (#/199), Gold Refractor (#/99), and X-Fractor (#/50). Like Finest and Bowman Chrome, Topps Chrome is another mid-end product with strong parallel variety. Featuring the simplest design on the list, the Kevin Durant Topps Chrome rookie includes a large action photo and a foil border. Parallels include Refractor (#/1,499), Orange Refractor (#/199), White Refractor (#/99), and X-Fractor (#/50). 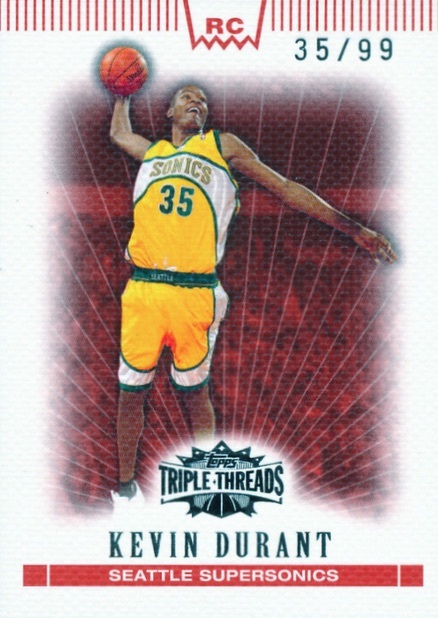 As the rarest base Kevin Durant rookie card, 2007-08 Topps Triple Threads makes up for the lack of autograph with a small print run. While 99 seems very low, when accounting for the parallels, the total production is over 200 thanks to the Sepia (#/66), Emerald (#/33), Gold (#/3), Platinum (1/1), and four Printing Plate (1/1) editions. Trapped autographs rarely seem to work out well and the 2007-08 Upper Deck Sweet Shot card is a perfect example of why this is normally the case. Instead of a signature on the card or on a sticker, a piece of material is autographed and then inserted into the card design. This can lead to obscured signatures like the Sweet Beginnings card below, and even problems with fading. Nevertheless, this KD rookie will always have interest even if it's his cheapest rookie autograph. 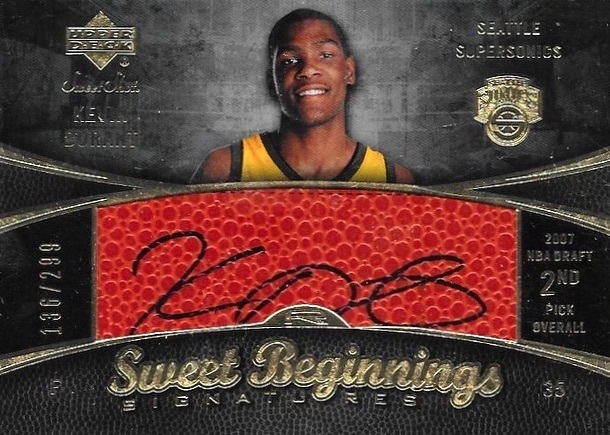 Although its spot on the list suffers from the higher print run and sticker autograph, the Hot Prospects rookie for Durant is still a solid-looking card. The flip side to this, of course, is that these RAP cards are more readily available and prices are more reasonable. Red (#/25) and Blue (#/10) parallels bring the rarity way down. There is a lot happening on this 2007-08 SPx card. 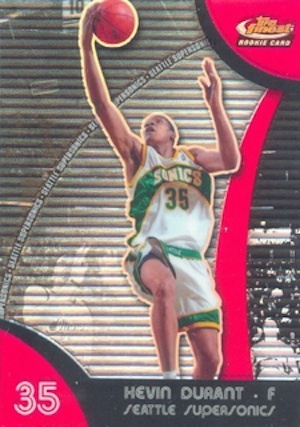 Heavy foil and dark images combine to form a Kevin Durant rookie card that you either love or hate. A small X-shaped jersey piece adds a little extra but the sticker autograph is a disappointing addition. Like the Hot Prospects card above, it appears that he signed the sticker using a regular Sharpie, which just does not look as good on such a small canvas. Tougher to find are the Radiance (#/25) and Spectrum (#/10) parallels. 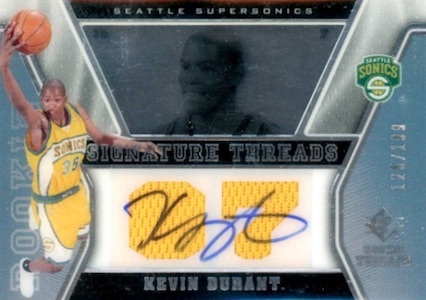 Somewhat offbeat among Kevin Durant rookies, the 2007-08 SP Rookie Threads card incorporates plastic stock which can present fading issues for the autograph. While signed directly on the card, the Signature Threads autograph is noticeably set above the die-cut jersey piece. More rarity is found in the Gold (#/50) and Silver (1/1) parallels. UD Premier is hardly a giant in the hobby but the Upper Deck line still put out some nice cards during its NBA run. It checks most boxes with the hard-signed offering limited to only 199 copies. The large, die-cut jersey does dominate focus and the tiny image of Durant tucked in the corner feels like an afterthought. His base is joined by Copper (#/99), Green (#/49), Blue (#/25), Red (#/15) and Gold (1/1) parallels. UD Black also has a very similar layout further down the list, but the scheme skews darker. Serial numbered to 99, Chronology features an action image inside of a framed border. This great-looking card is further enhanced by an on-card, silver ink autograph. 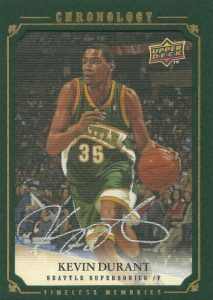 Several signed Kevin Durant cards populate the large checklist, including #104 (Mastery - #/25), #135 (Green jersey - #/99), and #159 (Draft photo - #/99). However, card #215, featuring the yellow uniform, is generally considered his official rookie. Each version also has a gold foil parallel with a green border. 2007-08 Upper Deck Ultimate Collection is a terrific option for collectors who are looking for a low-numbered card with an on-card autograph. While the base is limited to just 150, Gold (#/50) and Foil (#/10) parallels give collectors something else to chase. 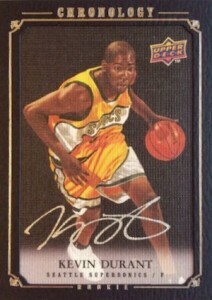 The SP Authentic Kevin Durant rookie card is arguably the best value on the list. With an on-card autograph, jersey piece and appealing design, the card has everything collectors want in a rookie card. A print run of 299 copies helps keep values from running wild but they are already quite high. The signed retail edition keeps the main design but ups the print run to 399 and removes the relic. Based on sheer jersey size, UD Black is the top option. The large relic swatch uses die-cut numbers to spell out "2007." Limited to just 99 copies, UD Black takes it a step further by using gold ink for the hard-signed autograph. 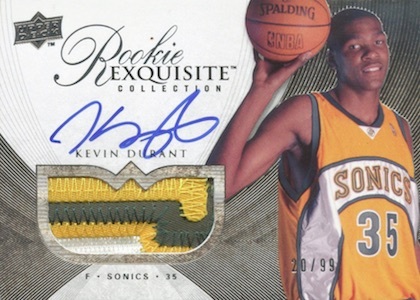 Last, but certainly not least, the 2007-08 Upper Deck Exquisite Collection Kevin Durant rookie card is the top option for many collectors. 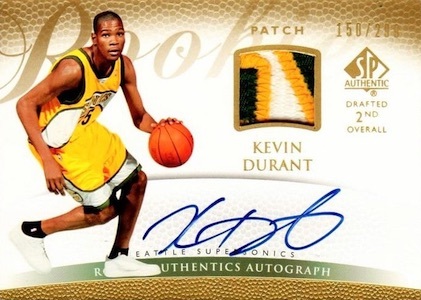 The Exquisite legacy combined with an on-card autograph, patch piece and low print run, leaves all other Kevin Durant rookie cards fighting for second place. 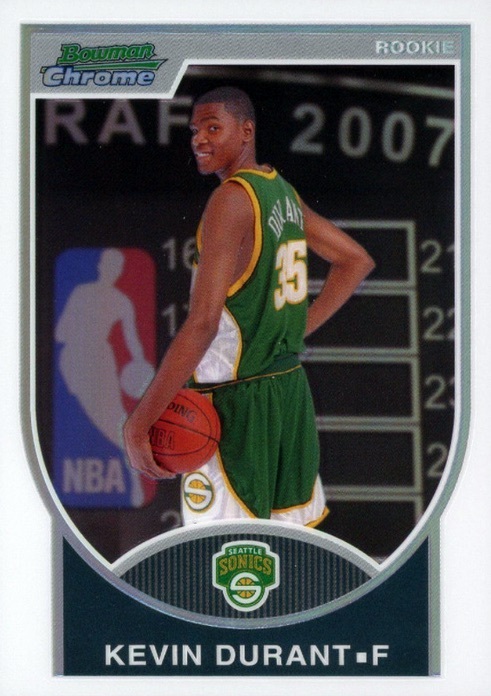 2007-08 Topps #112 KEVIN DURANT Rookie RC Seattle Supersonics FREE SHIPPING! KEVIN DURANT 2007 08 SP DESTINATION STARDOM ROOKIE INSERT #1 SP WARRIORS HOT! 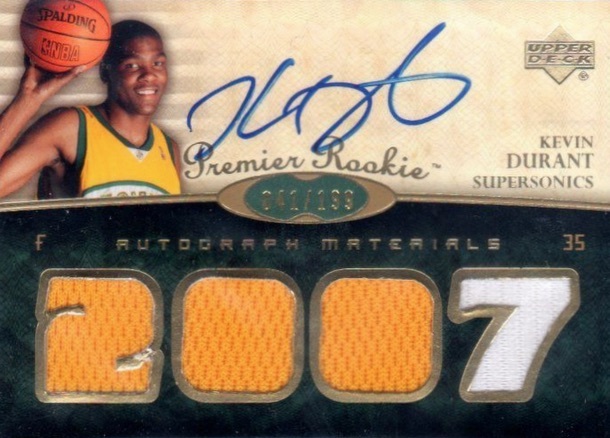 2007-08 SP Premier Prospects#106 Kevin Durant Rookie. Mint Condition. 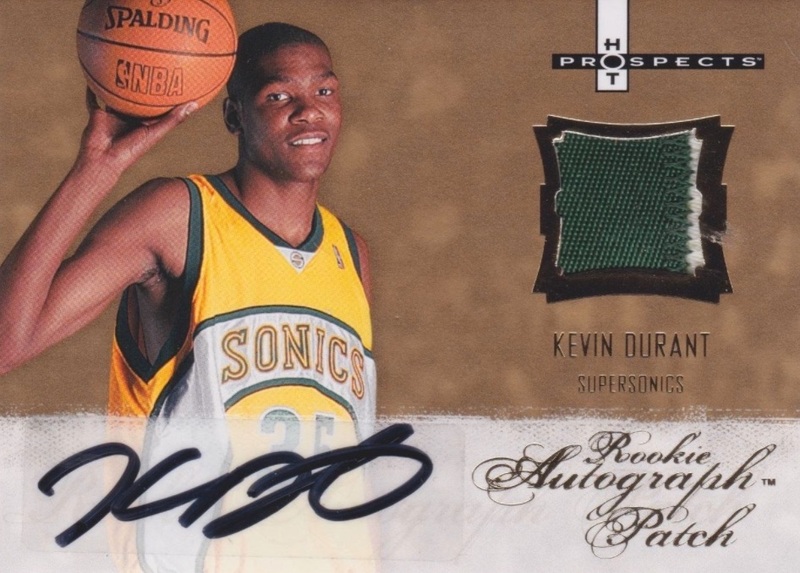 I have 2007-08 Kevin Durant Sp Rookie Authentics Autographs 18/299 and sold it on ebay, and the buyer just told me that the card was cut down and or trimmed. Have you seen this? KEVIN DURANT 2007-08 TOPPS FINEST RC ROOKIE CARD AUTO PSA DNA FINALS MVP!